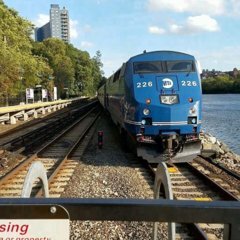 I wanted to create a thread to talk about any random comments you have relating to world transit systems. Anything relating to features of the systems, comparisons to systems in the United States, and anything that crosses your mind. I'll start of by saying that Montreal's Azur trains are by far some of the most unique trains I've ever seen. Bombardier really did a GREAT job on building those cars. Did you use them in Montréal? I used to go up there regularly (lived nearby) and there’s a few other things that we can model after them. No I haven't but just watching the videos on YouTube, than entire system is VERY unique, clean, and those trains are gorgeous. I love the design, reminds me of something out of the movie iRobot. I also like the door indicator lights, that change colors at stations and when the door is closing. The main obsession I have is the propulsion and those rubber tires. I can only imagine how smooth the ride is. lol... The entire city is VERY clean. A friend of a friend lived there and we went up to visit him and see a perfect circle years ago. After the show, we walked Downtown and walked back to his place and I kept looking around for trash and the place was spotless. Puts NYC to shame for sure... Visit when you can. My friends would fly out of Montréal when going back to Europe so I would go up a lot to see them off or hang out. It’s a cleaner, more European version of NYC. The university that I went to wasn’t very far from where they would test the first new NYC subway cars at (Bombardier). The language barrier would be my only problem, although French is similar to Spanish. But yes puts NYC to shame forreal. Here's an action video at various stations. Believe it or not it really isn’t that bad. Going to the Downtown area by St. Catherine Street and other areas, most people speak English and Canadian French. The signs are in Canadian French, but that’s not a big deal. I speak some French so I always helped out my friend when necessary with signs, etc. You still get a decent deal on the exchange rate too (last I checked).